The way the Japanese use mayonnaise is similar to the American South with hot sauce: perhaps overzealously, a bit trigger-happy, and with its users convinced it could be added to damn near anything. If it can be inserted into mouths, the Japanese can similarly make the case for mayo’s addition. A brief list of its many applications: on yakisoba noodles; as a dip for fried chicken; on the savory meat pancake okonomiyaki; as a batter on its way to crispy shrimp; in sushi and fruit salads. I debated whether to describe Japanese mayo aficionados on the level of “diehards,” and decided yes, because what other country has a dedicated mayonnaise museum (called Mayo Terrace)? Theirs is a reverent, liberal approach to mayo that, for whatever reason, hasn’t translated to American shores. One explanation to why the Japanese are more open-minded about mayonnaise than their Western counterparts: The mayo is far superior. It’s less stiff than the jarred American stuff, silkier in texture, with a taste that’s a specific-to-Japan savory richness. 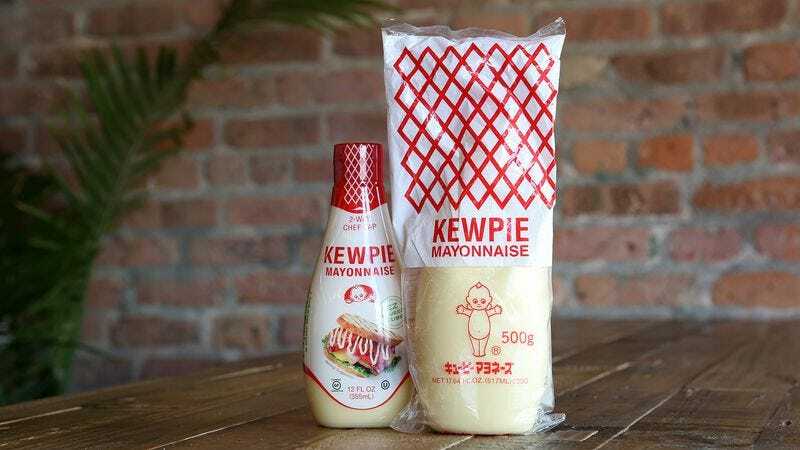 When we talk Japanese mayo, we’re almost certainly talking about the Kewpie brand, the beloved condiment that has as much brand recognition in Japan as Hellmann’s does in the United States. As food packaging goes, the Kewpie squeeze bottle is as iconically identifiable as a Pringles can. It’s made from pliable, translucent plastic, pear-shaped with a distinctive red cap. The design is blank and minimalistic; there’s no label hiding the mayo’s pale yellow cream within. Its adorable baby mascot is based on Rose O’Neill’s 1909 cartoon creation, which later became the ubiquitous children’s doll. That character trademark is now owned by the Kewpie Corporation—though knockoff brands have copied the Kewpie design for decades. Kewpie mayo’s history can be traced back to one Toichiro Nakashima, a seafood importer who found success in the 1910s canning crabs. When Nakashima traveled to the U.S., he noticed the way Americans ate, and thought he could emulate some of their healthier eating habits back home. One way to make vegetables more flavorful was with mayonnaise and salad dressings—then a foreign concept in Japan. Nakashima brought home the idea, tweaked the recipe to satisfy Japanese palates, and the first glass jars of Kewpie mayo began appearing on Japanese store shelves in 1925. The mayonnaise quickly became a success: Company lore says Kewpie went from 600 kilograms (a little more than half a ton) shipped in its first year to 7 tons the following. Getting that specific Kewpie taste begins with the eggs. Terry Dunseith, a spokesman with Q&B Foods (the American subsidiary of the Kewpie Corporation), tells me only yolks are used, which makes for a creamier, eggy-rich product. The Japanese Kewpie recipe uses a proprietary blend of vinegars—red wine and rice vinegar among them—giving the mayo its idiosyncratic, sulfur-free balance. Until now, all Kewpie mayo purchased Stateside was imported from Japan. In the coming months, Kewpie will begin producing an American version, with plans for a national rollout sometime in early 2017. Sadly for purists—and in deference to American attitudes—this version will not use MSG, though the recipe will otherwise stay the same. Its iconic squeeze bottle will also be different, since a label will be necessary to include FDA-required nutritional info. I got a chance to sample the American Kewpie, and I have to say, it’s about 90 percent as good the Japanese version. It’s less rich on the palate, noticeably sweeter, and with the vinegars more pronounced. All in all, it’s like a freshly whipped homemade batch of Miracle Whip. The differences between the two versions is roughly that between U.S. and Mexican Coke: Only obsessives like myself would spot out the subtle contrasts, but for most others, even 90 percent of a superb Japanese mayo is still 100 percent better than anything else Stateside. Even when whipping up homemade mayonnaise using lavish French methods, I still prefer bottled Japanese mayo. If you’ve had a spicy tuna roll, chances are you’ve consumed Kewpie mixed with sriracha, but it can similarly substitute wherever you’d use regular mayo. To me, there’s almost a Hollandaise quality to its appeal. I use it in deviled eggs, turkey sandwiches, and potato salads, just to name a few. But in all honesty, my usage of Kewpie borders on chemical dependency. In conjuring up excuses to use Japanese mayo, I’ve found it to be surprisingly versatile. In place of butter, I’ll slather it on the outside of a cheese sandwich before toasting on a skillet. And my mind was in a desperate place one late night when I combined instant noodles, ramen packet seasoning, a dash of Worcestershire sauce, and a one-Mississippi-two-Mississippi squeeze from the Kewpie bottle. It may sound crazy to the non-converted, but it worked. Oh man, it worked.